We realize that you cannot feel the cloth through our website, and that colors will vary somewhat according to your monitor. You may request up to 6 sample swatches without charge. These are approximately 3x3 inches in size. Once you order, you are eligible for another set of swatches for your next purchase. 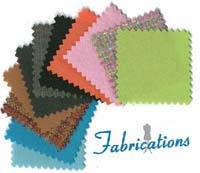 To order swatches, or to get more information about a particular fabric, please call or email us. Please be sure to provide us with Catalog Number(s) of the item(s) that interest you.